When copying, duplicating or cloning an item tree (an item and its descendants) references in e.g. link, rich text and tree list fields remain unchanged. This makes sense as far as references to items “outside” the duplicated item tree are concerned, but references pointing “inward” should be modified to point to the original item’s counterpart amongst the copied items. E.g. 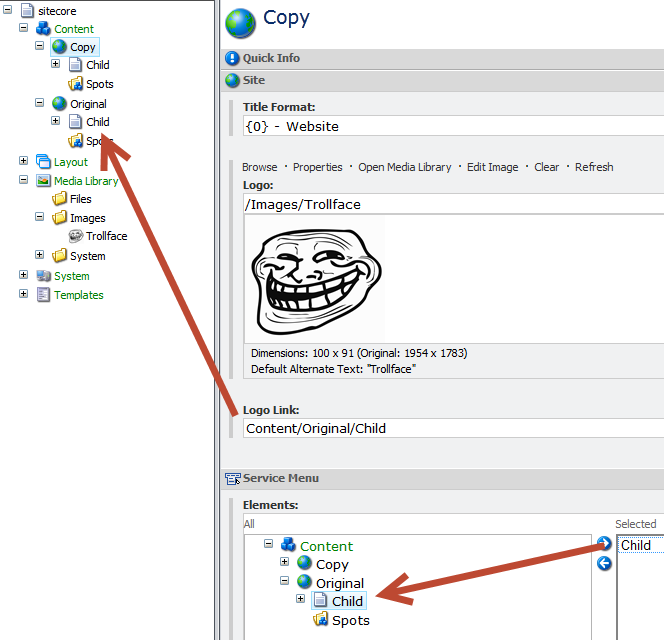 : The item “/sitecore/content/Original” is copied to “/sitecore/content/Copy”, along with all its descendants. Assume that “Original” contains a link to the item “/sitecore/Content/Original/Child”: even though “/sitecore/content/Copy” has an equivalent child item (located at “/sitecore/content/Copy/Child”), the link in “Copy” is still referencing “/sitecore/content/Original/Child”. The method of duplication is irrelevant; copying, cloning and duplicating all behave the same. 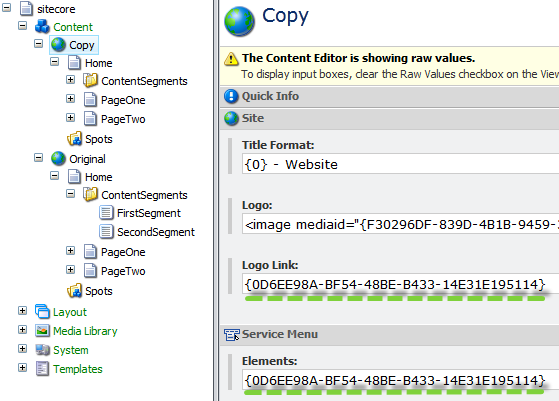 An example of how rich text, link, tree list, layout and similar fields can be updated to reference the proper copies is outlined in the following. Examples are based on Sitecore 6.6 and .NET 4.5. A pipeline processor creates, copies, duplicates or clones an item, or the item:added event is triggered. The source and target of the operation is passed to a ReferenceReplacementJob which uses the Sitecore.Jobs.JobManager to run asynchronously. An ItemPathTranslator is used to translate between source and target item paths. Pairs of source and target items, found using the translated paths, are added to an ItemReferenceReplacer. Once all pairs have been added, the reference replacer processes all “non-Sitecore fields” and the layout field (“__Renderings”). All ID’s, paths etc. from the “source item tree” are replaced with their equivalents from the “target item tree”. To overwrite and/or amend the Web.config file with the required pipeline processors, save the following to a .config-file and place it in the “App_Config/Include”-folder. Replace namespace and assembly names as needed. The standard DuplicateItem processor has to be replaced with a slightly modified version, due to the lack of information it conveys to later pipeline steps: it’s not possible to determine the source and target of a “duplicate item”-operation. The standard implementation of the copy and clone-processors do not have this problem, which simplifies amendment of the corresponding pipelines. The DuplicateItem-processor is based on the inner workings of Sitecore.Shell.Framework.Pipelines.DuplicateItem, with just enough modifications to create a ReferenceReplacementJob of off the source and target. Both the copy and clone pipelines are provided with CopyItemsArgs containing source and target of the “duplication-event”, allowing for a clean extension of the respective pipelines (rather than forcing decompilation/rewriting of existing processors). The following handler is courtesy of Wilhelm who suggested using the item:added event instead of the uiAddFromTemplate pipeline, which allows for clean extension and handling of branch-based item creation. The ReferenceReplacementJob retrieves all source and target items using an ItemPathTranslator, and eventually lets an ItemReferenceReplacer process all target items. Item paths are “translated” relative to a common root item (e.g. 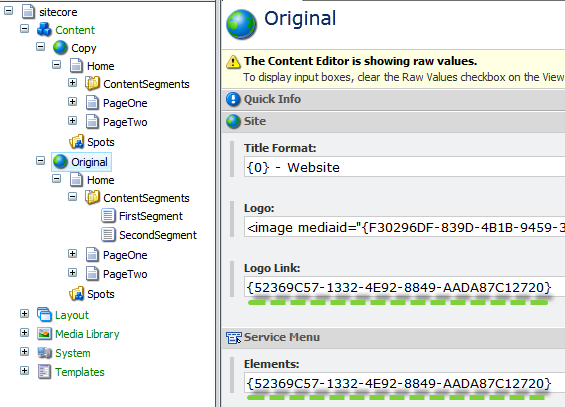 a site root item in a multi-site solution, or the content root in a single-site solution). Item references are stored in different formats in Sitecores various field types, hence reference replacement is performed in four ways: ID, ShortID, full path and content path. Using this “broad spectrum” approach allows proper replacement of references in all relevant field types (general link, rich text, layout, tree list etc.). Example of droptree and treelist field. The field contents have been properly updated by ReplaceID. Example of rich text and general link field. The field contents have been properly updated by ReplaceID, ReplaceShortID and ReplaceContentPath. Example of data source path in layout field. The field content has been properly updated by ReplaceFullPath. Data source IDs would also be replaced correctly, hence the replacement process is compatible with Convert Data Source Paths to IDs and similar solutions. This entry was posted in C#, Sitecore, Sitecore 6.6 and tagged cloning, copying, internal links, item links, item references, reference fields, Sitecore. Bookmark the permalink. Any chance of posting the code? All code required to make it work should be available from the snippets in this post. If a piece of the puzzle is missing, you’ll have to point it out to me. I didn’t consider moving the logic to the non-UI pipeline, it’s a much cleaner solution – thanks for the input, I’ll update the code accordingly! Atleast this works in Sitecore 7.0 not tested in any earlier versions yet. Thanks for the post. I’ve used it on a recent project where we had to change the datasource in the presentation for each of the page components that were relative to the page and had to be updated when a user was copying and duplicating items. Thank you for the heads up! The particular client for whom much of this code was originally written hasn’t upgraded to Sitecore 7 yet, so I’ve been oblivious to this issue so far. I really appreciate your work and effort you take to share solution with us. I have implemented in our environment with little changes as below. 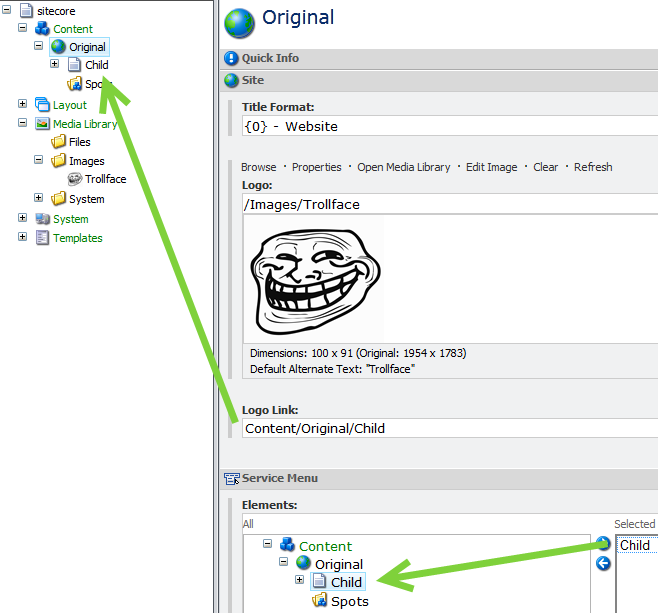 Scenario client wants same website like parent, including sharing of content but with conditional rendering of domain. Thus we choose to select clone option. //This will only return 100 items. It sounds as if Query.MaxItems is set to the default value of 100 in your solution (search for “Query.MaxItems” in Web.config). It’s a setting which limits the number of items returned from any Sitecore query. Try changing it to e.g. 1000 and see what happens when you run the original code. Setting it to 0 will remove the limit and always return all results from a query. I believe Query.MaxItems =100 is for better performance and I don’t want to touch that stuffs because once you change it, it will return specified amount of data every time for every request and also sitecore environment, which we might not required. How will this handle 4 or more levels deep items ? Items created from branch templates ? An item tree 4 levels deep will be handled like any other item tree, there are no restrictions regarding the level of nesting. If you find that some of the code doesn’t work for items below a certain depth, I suggest checking your web.config for e.g. the MaxTreeDepth-setting and ensuring that it’s set according to your expectations. Items created from branches are handled by the AddFromTemplate pipeline processor. Search for “branch” and you should find it eventually. One note on the branch templates. The ItemReferenceReplacer won’t create ItemPair for the child nodes with $name token in them. The reason is – ItemPathTranslator won’t replace the token and won’t find the item. As a result those child nodes will be skipped and will keep the links pointing to the original structure. A very easy fix is to add relativePathPart.Replace($name, _target.Name) in the ItemPathTranslator.GetFullPath(). Hope it helps! Thanks for the info! I misunderstood the initial question, not realizing that it was concerning copying a branch itself, rather than using it to create new content. I’ve only ever used the code posted here for copying “actual content”, not branch items, template items and the like. It’s a bit surprising that the expandInitialFieldValue and expandBranchItemName pipelines aren’t triggered when copying or creating items using this code. Thanks for this example. It is still working on Sitecore 8.1. The only thing I had to adapt was to include the FinalLayout field in the ExcludeStandSitecoreFieldsExceptLayout method.